Khomas education director Gerard Vries, deputy minister of education Silvia Makgone, chief executive officer of the Pupkewitz Group of Companies Dougie Truter, and Meryl Barry, CEO of the Pupkewitz Foundation in one of the new class rooms with teacher Brenadette Kasaona. 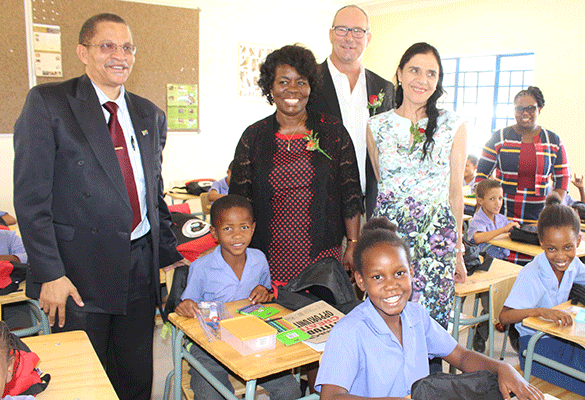 THE Groot Aub Primary School this week received a donation of new furniture for four new classrooms constructed by the Pupkewitz Foundation in January. The furniture, worth N$144 720, was donated on Tuesday by the First National Bank of Namibia Holdings Foundation Trust, and comprises chairs, desks, notice boards and lockable steel cabinets. The donated furniture will be for the new Grade 4 classrooms which were built by the Pupkewitz Foundation. The classrooms were officially inaugurated yesterday. The four classrooms and the multi-purpose room were built for N$1,3 million. The Pupkewitz Foundation has also done additional renovations at the school for N$226 000, including applying a new coat of paint and repairs to school toilets. The school caters for children from pre-primary to Grade 7. It has an enrolment of 941 pupils, and 29 teachers. The Principal Judika April said the school had in the past struggled with pupils not turning up for afternoon classes. This arrangement can thus be abolished now that there is enough space for all children during normal school hours, from morning to around mid-day. “In the afternoon when parents are at work, some pupils do not bother coming, and the parents were not noticing this unless the school informed them,” she said. April noted that the construction of additional classrooms was part of an initiative to get rid of the double shift schedule introduced by the ministry of education. The most affected children who attended afternoon classes at Groot Aub Primary School were those in Grades 3 and 4. The school also caters for children from surrounding farms. Speaking at the inauguration, Pupkewitz Foundation CEO, Meryl Barry said attending classes in the morning was the best for primary school pupils. The chairperson of FNB Namibia Holdings Foundation Trust, Clara Bohitle, said the new furniture would motivate both pupils and teachers to improve performances. “The contribution in the form of school furniture is an important step in creating a conducive learning environment,” she said. Education permanent secretary Sanet Steenkamp said social conditions were impacting the future of pupils, and the involvement of all stakeholders was necessary to ensure children did not succumb to social ills. She also urged pupils and teachers to take care of the furniture so that other pupils could also benefit from the donation in future. Pupkewitz Toyota furthermore donated 300 school bags and educational materials to the pupils in the new classrooms, as part of its ‘Future in a bag’ project. The Japanese embassy will also be building an additional block of four classrooms and a storeroom at the school this year.